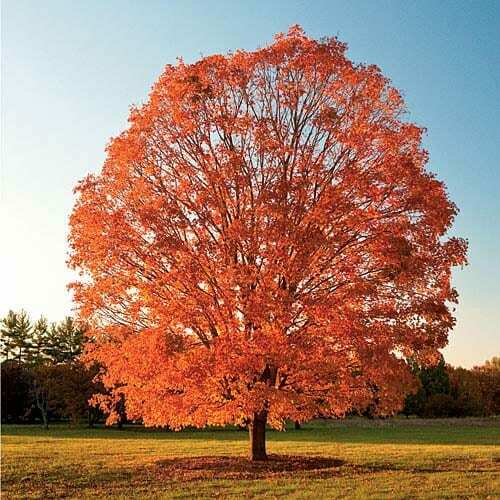 Sugar maple is a large tree, often 80′ or more tall with a trunk up to 3 ft (0.9 m) in diameter. It has a large, dense and rounded crown and is one of the giants of the forest. Its leaves are opposite, palmately lobed and deciduous. Sugar maple has deeply furrowed gray bark which turns almost black when wet. The fruits of the sugar maple are called winged samaras and appear before the tree leafs out in early spring. You may have played with them as a schoolchild – we called them helicopters and dropped them from heights to watch them whirligig to the ground. There are dozens of named cultivars of sugar maple, selected for fall color, shape, leaf characteristics, size, hardiness or sugar production.